Without a party committed to a reform agenda, India will struggle to realize its potential. India’s difficulty in advancing serious economic reforms is ultimately due to the lack of a home-grown intellectual tradition that can underpin them. The Congress Party, long a bastion of statist thinking, is proof of this proposition. But fresh evidence comes courtesy of the Aam Aadmi (“Common Man”) party, the rising anti-establishment movement that oddly combines an emphasis on clean government with backward economic views. This void accounts for a number of striking paradoxes. India has made a name for itself as a mainstay of the global technology sector, yet remains one of the world’s least globalized economies. A new study ranks it 123rd out of 139 countries – and 8th out of 12 in the South and Central Asia region – when it comes to various dimensions of global connectedness. Likewise, India ranks 100th out of 132 countries on the World Economic Forum’s global enabling trade index. Another paradox: As finance minister back then, Manmohan Singh famously inaugurated the 1991 reform era by quoting French novelist Victor Hugo: “No power on Earth can stop an idea whose time has come.” Yet as the incumbent prime minister he was all but mute when the 20th anniversary of these reforms came around and now gives every sign of being trapped in Samuel Beckett’s absurdist play, Waiting for Godot. Singh, who is ending his time in office, has received much criticism for what The Economist terms ”Brezhnev-grade complacency.” But the real source of India’s travails is much more entrenched. The Nehru-Gandhi political dynasty running Singh’s Congress Party has a long history of anti-business sentiment. Jawaharlal Nehru reportedly once told J.R.D. Tata that he considered “profit” to be a dirty word. The 1991 reforms created great dissension within Congress, with the party’s own newspaper lambasting them as doing little more than giving “the middle-class Indian crispier corn flakes or fizzier aerated drinks.” “That,” the paper wrote, “could never have been the vision of the founding fathers of our nation.” And the party has devoted much of its time in power over the past decade instituting expensive, market-distorting social welfare schemes instead of productivity-enhancing measures. Back when the growth rate was flying high a few years ago, the party’s ideological fixations resulted in many squandered opportunities. But now that the economy is in the doldrums, they are a genuine impediment to recovery. 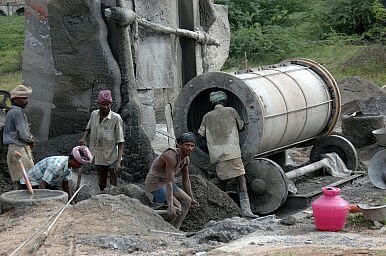 New Delhi has just reported an official growth rate of 4.5 percent in the 2012-13 fiscal year, half the tempo in 2010. In the 2000-2012 period, job creation grew at the abysmal rate of 2.2 percent per year. And Crisil, the independent credit ratings agency last month announced that this sluggish pace will slow further in the next few years, trapping many rural young people in a life of poverty. Yet in the face of these trends, the party’s prescription is to mandate private-sector hiring quotas benefiting socially disadvantaged communities. This is despite all of the evidence that anarchic laws governing labor markets have stifled the growth of labor-intensive manufacturing, something which should be a huge comparative advantage for India. Congress was also behind legislation that passed last summer requiring corporate spending on social welfare, further burdening companies in a country where the government has a notoriously lousy record of providing public goods. One of AAP’s leading lights has declared that globalization and profit-making are the main drivers of government corruption. India has quite the history of crony capitalism and the Singh government’s shenanigans have more this scourge even more obvious. But the proper response to economic cronyism is not to scale back the country’s engagement with the global economy, especially given its pronounced dependence on foreign capital, technology and expertise. Nor is it to denigrate the Indian private sector, which has earned worldwide respect for entrepreneurial prowess. Rather, the remedy lies in the hard task of creating honest and transparent regulatory mechanisms to which all businesses, domestic and foreign, are subject in like measure. Yet so far, the AAP is more interested in striking heroic poses than doing the serious spadework of good governance. Even worse than the irresponsible rhetoric are the costly populist handouts the AAP instituted once in office. Delhi faces serious energy (here and here) and water (here) shortages amid a plethora of other staggering infrastructure challenges. Yet the party has cut power tariffs in half and allotted 20,000 liters of free water to households per month. The giveaways will further aggravate the strained finances of the private power companies supplying the city as well as the local water authority, both of which instead should be given incentives to upgrade and expand capacity. Moreover, the AAP reversed the previous local government’s decision allowing foreign retailers like Walmart and Tesco to set up supermarket chains in Delhi. The party argues that opening up the country’s vast retail sector to foreign businesses might benefit consumers but would also force millions of mom-and-pop shops to go under. This view overlooks the long-term transformative effects, however. A recent study by the Boston Consulting Group and the Confederation of Indian Industry concludes that the liberalization of the multi-brand retail sector would create 3-4 million jobs directly and another 4-6 million through its indirect effects. It would also save consumers $25-30 billion a year and increase government tax revenues by a similar amount. Just as important, retail liberalization would go far in rectifying the country’s grossly inefficient and corruption-riddled food procurement, storage and distribution system. This, in turn, would give solace to consumers, especially the poor, who have for years been plagued by the world’s worst food inflation. Ratan Tata and other corporate leaders are pinning their hopes on Narendra Modi’s elevation to the prime ministership. The business-friendly chief minister of Gujarat has made his state a magnet for foreign investment. And his decisive, hard-charging persona is a vivid contrast to Singh’s taciturnity and ineffectualness. But he and his Bharatiya Janata Party – supposedly the pro-business party in India – have vigorously opposed retail liberalization (here, here and here). Indeed, just like the AAP in Delhi, the newly elected BJP government in Rajasthan state has overturned its predecessor’s decision to permit the greater presence of foreign companies in the retail sector. What’s more, the BJP has its own record of supporting costly welfare programs, including a far-reaching food security bill last year that will only widen the country’s high fiscal deficit. Now it is pushing an expensive health security program in an attempt to garner votes in the upcoming parliamentary elections. Following last summer’s currency crisis that prompted comparison to the 1991 economic debacle, it’s telling that no political leader used the opportunity to commit to a new round of economic reforms. Granted, it’s a tall order in a cacophonous democracy to air remedies promising long-run rewards only after a period of pain, all the more so as the electoral season gears up. But until a political party emerges genuinely committed to the reform agenda, India will remain the proverbial “country of the future” – full of vast potential but never coming close to achieving it. David J. Karl is president of the Asia Strategy Initiative, an analysis and advisory firm, and heads its practice on South Asia. He can be reached via Twitter @DavidJKarl. It has potential, but India won’t see innovation gains without cultural and institutional change. India’s Economy: Time to Revisit 1991How Darkness Sheds Light: India’s Democratic DysfunctionIndia's Place in the Sun: The International Solar AllianceDid India Miss an Opportunity for Reform?Modinomics: Myth or Magic?